Unified Commerce is a retail strategy that caters to customers engaging across a brand’s multi-channel touchpoints: in-store and online, interchangeably. It’s proven that these unified shoppers deliver a higher lifetime value to your company. The question becomes how do retailers recognize their customers and track their interactions to effectively build personalized relationships? Retention is no longer enough; in a day where digital word of mouth is perhaps your greatest asset, driving customer loyalty, and brand evangelists is key to success. How can retailers achieve this? It’s one thing to know the customers that come in your door; that you interact with face-to-face. But what about the “anonymous” online shopper? Customers that have become well acquainted with your brand online risk being disappointed if they are treated like a stranger when they enter your physical store for the first time. These are the challenges modern retailers face in a market where in-store and online customers are one and the same. CXM for furniture retailers is an in-store technology application designed to support retail sales associates in delivering exceptional experiences. Mobility on a showroom floor is valued by customers that are looking for sale’s associates to add value to their shopping experience. This includes being experts on product knowledge and helping them find what they are looking for conveniently. CXM is designed to be device agnostic with a responsive user interface. This enables your associates to take control of their individual performance. They can access their customers, open shopping carts, and follow up activities from their own mobile phones to close more business. With Customer Profiles, you can maintain detailed contact records. This includes customer information for targeted marketing campaigns. Connected via email, profiles are updated based on a customer’s activity completed when logged in with their account both in-store and online. STORIS’ search allows retailers to easily locate a customer to avoid duplicate records. Historical duplicates can be merged to create a singular Customer Profile view. Collect all customer shopping history in one organized location. This includes both completed and open sales orders. STORIS directly links to the transactional record for an efficient POS experience. STORIS’ Unified Shopping Carts are accessible to the sales associate via CXM. This enables a sales associate to modify and complete open carts that the customer began online. Access to a customer’s purchase history allows sales associates to analyze styles and price points. They can also use this information to upsell and help complete a room design. STORIS’ CXM helps the associate by taking this a step further. It uses algorithms to analyze the product history surrounding a customer to suggest products for the associate to recommend. 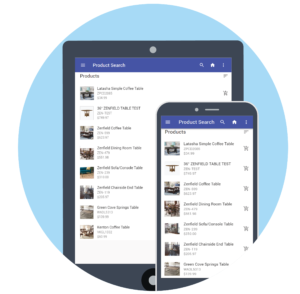 To support the expertise of sales associates, inventory information is always in the palm of their hands with CXM. This includes descriptions, imagery, pricing, promotional details, and close alternatives. Information to help close a sale is also available such as quantities on hand and estimated delivery dates. CXM is a valuable prospecting tool for associates to attain higher closing ratios. Sales associates are communicating with customers in a variety of ways including personal conversations, emails, phone calls, and texts. The Customer Interaction Timeline is a chronological feed of activity recorded by the sales associate. Notes and follow up reminders can be added to ensure the associate is staying on top of closing open sales orders and maintaining timely communications. This rich history is also valuable to a new sales associate working with an existing customer, giving them context to personalize the relationship. In an age where customers reward brands that prioritize experiences with their loyalty, having the right technology to optimize your Customer Experience Management is key. Learn more about CXM by filling out the form.